It is open source, but plugins of browsers have access to all the data of the visited websites. 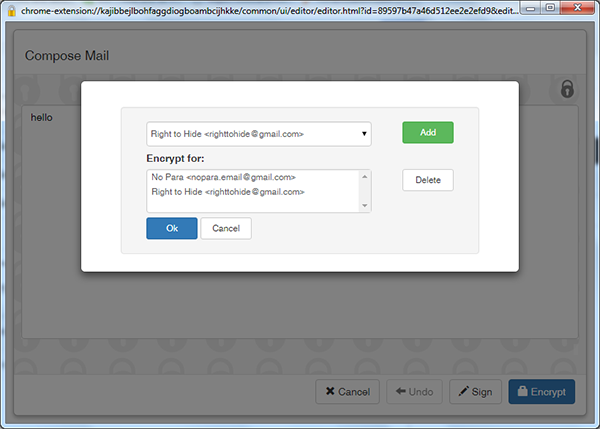 We will briefly explain how e-mail encryption works and guide you step by step on how to use it. Public key: used to encrypt messages, accessible to anyone. Private key: used to decrypt messages, has to be kept safe, protected by a password. In order to use encrypted messaging you need to create a keypair consisting of a public and a private key. 2. 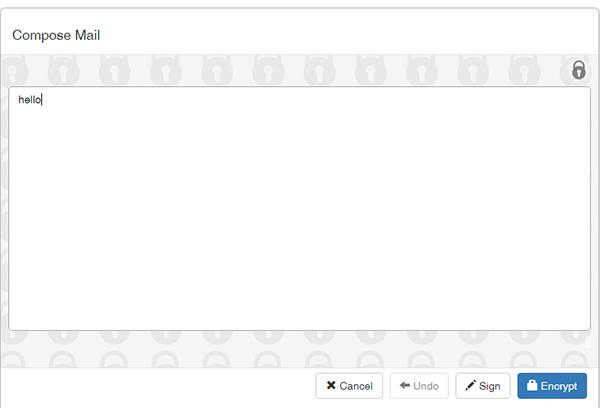 Click the Mailvelope lock icon in your browser to open the menu. 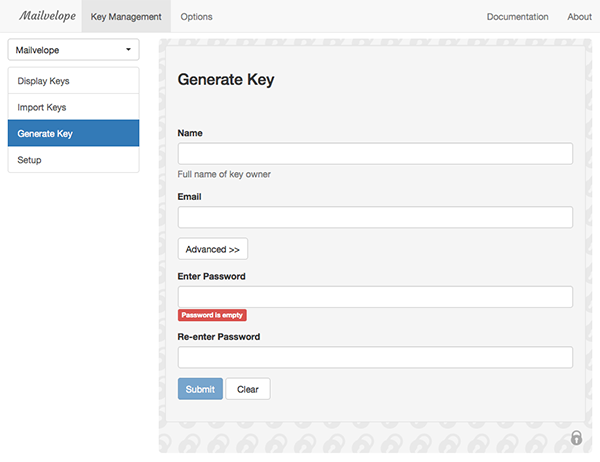 Choose “Options”, then “Key Management“ and “Generate Key”. 3. Fill in your data and set a password which you will use to access your key. Store your password securely. If it gets lost, you won’t be able to set another one and you will lose access to your key. 4. Click “Submit” to create the keys. You can view them at “Display Keys”. They can be sent directly by e-mail. They can be published on a website. They can be uploaded to a keyserver such as this: https://pgp.mit.edu. If you received the key file, you need to import it into Mailvelope. 5. 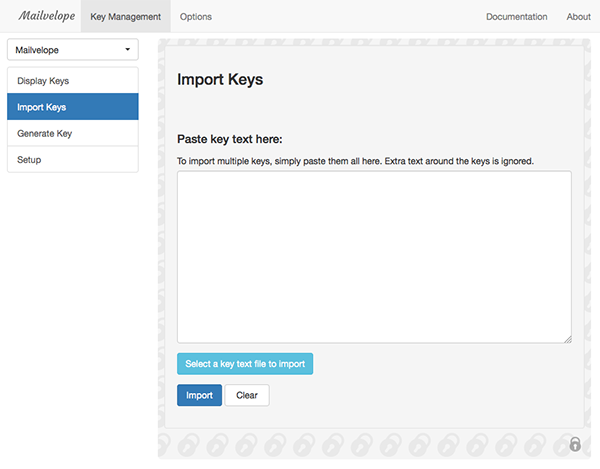 Click on “Import Keys” on the “Key Management” tab. 6. The easiest way to import the key is to choose the saved key file from the computer by clicking “Select a key text file to import”.You can also choose to copy and paste the key in the text box. Click “Display Keys” to check whether the import was successful. By clicking on this you will launch the Mailvelope editor popup. This is where you should type the message you want to encrypt. Composing the message in a separate window ensures that the encryption process is isolated from the e-mail provider. 8. You can encrypt your message by clicking on the “Encrypt” button. 9. In the popup window, use the “Add” button to choose the names who will be able to decrypt the message from the list on the top. Add the recipient(s) and yourself so you will also be able to read the message later. At this point you need to know the public keys of the recipients. 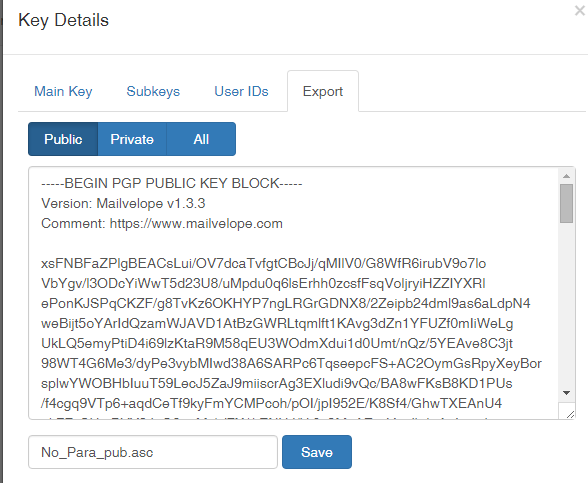 Follow the “Importing keys” section to add the public keys to Mailvelope. 10. 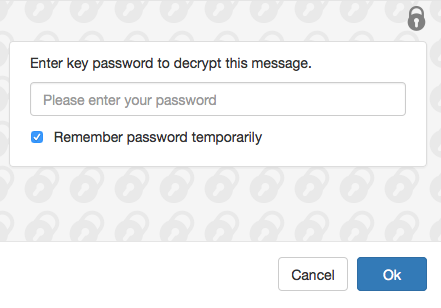 When you click “OK” the original message will be replaced by the encrypted one. The “Undo” button converts it back to the original. You can also sign the message. As opposed to encryption, this authenticates it as originating from you and attests that the content was not changed in transit. The recipient can verify this with your public key. 11. Finally, “Transfer” closes the editor and the encrypted or signed message loads in the original composition window, and you send the e-mail as you usually would. 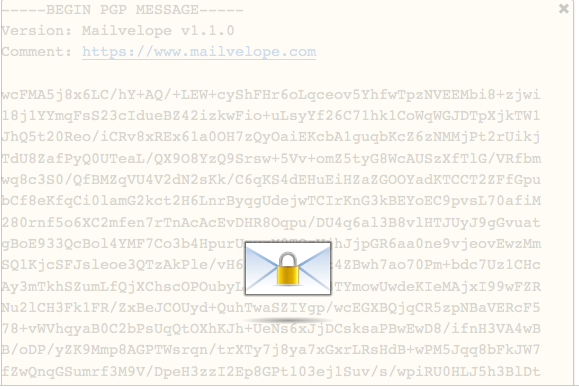 Note that it is not possible to encrypt attachments with Mailvelope. It is important not to leave the composition window of your e-mail provider during this process. 12. You can export your keys under “Key Management” – “Display Keys”. You may use this to save your public key so you can share it with anyone who would like to send you an encrypted message. Hover the mouse over the key and click the information icon. 13. Choose the “Export” tab on the popup window. If you would only like to save your public key, select “Public” in the top row and click “Save”. 14. If you want to save both keys, for example, to store a backup, select “All”. 15. 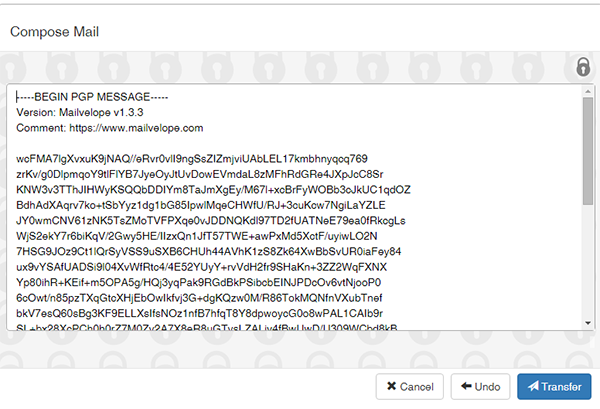 When you receive an encrypted e-mail, Mailvelope will display a closed envelope icon over the message. Clicking the icon will start decryption. 16. Provide your password in the popup window. 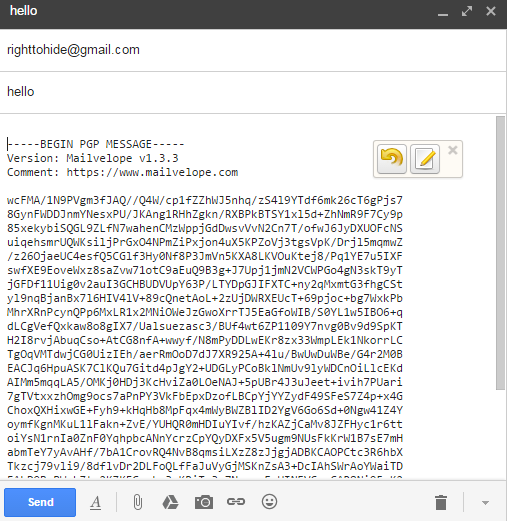 Mailvelope then searchs for the private key needed to decrypt the content and displays the original message. It is also possible to configure it to work with other providers with “Options” – “List of Mail Providers” – “Add new site”.